RATCHABURI: Prosecutors have decided to press six charges against Premchai Karnasuta but dropped one count, indicating there is no proof the construction magnate pulled the trigger on the wild animals killed in Thungyai Naresuan Wildlife Sanctuary. His three companions on the Feb 4 trip into the wildlife sanctuary will also be indicted, two of them with illegally having firearms in their possession in a sanctuary. They are Italian-Thai Development employee Yong Dodkhruea, Nathee Riamsaen and Thanee Thummat. The decision was made public by the Office of Public Prosecution Region 7 at a media briefing today (Apr 4). It had already been sent to the Provincial Police Region 7 commander for comment, the announcement said. If police agree with the charges, the case will be forwarded to Thong Pha Phum Provincial Court and the suspects arraigned. If not, the Office of the Attorney-General will make the call. Thungyai Naresuan park chief Wichien Chinnawong is the plaintiff suing the four defendants. They were arrested at their illegal campsite inside the sanctuary in Thong Pha Phum district of Kanchanaburi on the night of Feb 4, with the carcasses of a rare black leopard and a silver pheasant, both protected species, and a wild pig, not a barking deer as initially reported. The Italian-Thai Development president faces six charges – including having firearms in a public place, hunting protected species and possessing the carcasses of protected animals. The charge of illegally having firearms in a sanctuary has been dropped. Yong faces indictment on seven counts, the extra charge being possessing firearms in a sanctuary. Nathee faces five counts, the poaching charge was dropped, and Thani eight, the additional charges being firearms possession and intent to hunt. The indictment will also claim damages from all four totalling B462,000, payable to the National Parks, Wildlife and Plant Conservation Department. 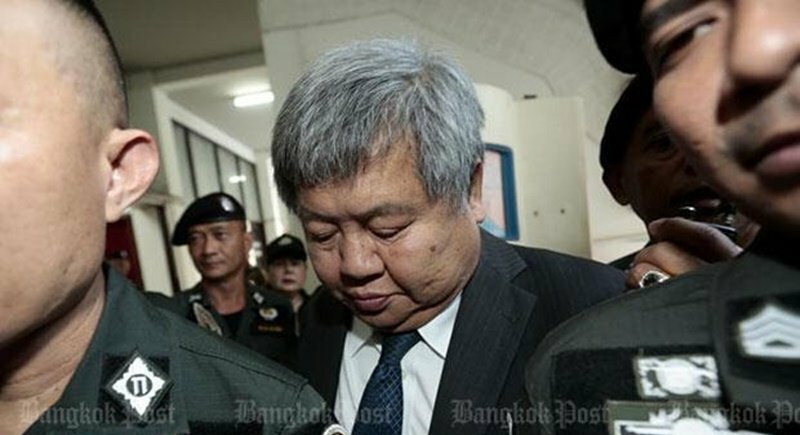 Somsri Wattanapaisarn, the director-general of the Office of Public Prosecution Region 7, said today that prosecutors will draft the indictments while they await a reaction from the police. Hmmm...looks like money and legal wrangling are starting to slither their way into the case against the bloated scumbag Premchai. He is the financier...he made it happen, and don't think for a second that he was gonna sit by and watch his lowlife comrades have all the fun shooting these animals. Too bad the police have oversight here, as that doesn't fare well for justice. No proof of pulling the trigger. Indict all 4 of them. Give them the chance to corporate and point as witness finger to whom did pull the trigger. I think it was the cook. Huh, a cook? Why did Premchai bring a cook to a wild sanctuary?